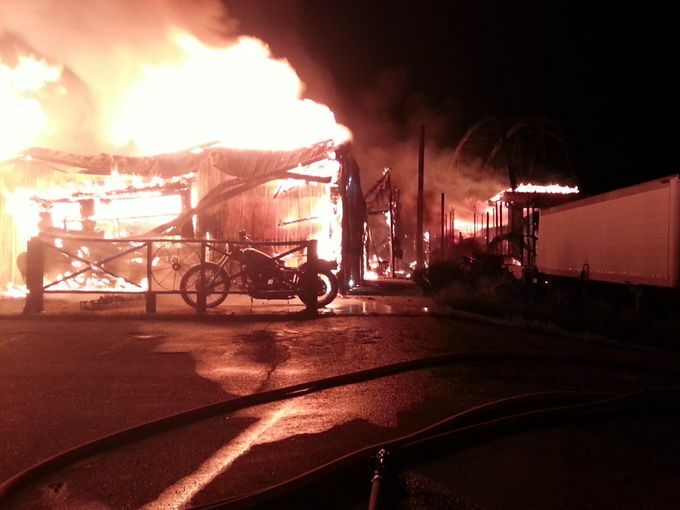 The iconic Full Throttle Saloon, a popular hangout spot for bikers attending the annual Sturgis Motorcycle Rally, has burned down with some suspecting foul play. The bar, which had gained fame in part thanks to a reality TV series of the same name, was destroyed in a massive blaze on 8 September. According to a report in the Argus Leader, 45 firefighters from multiple fire departments were called out to battle the inferno. Firefighters struggled to contain the blaze due to inadequate water supply and the fact that the bar was constructed primarily of wood and steel beams. "There was a a lot of dry wood in there," Assistant Fire Chief Scott Lensegrave told local TV station KOTA. No one was injured in the fire, but saloon representatives estimate a loss of roughly $10 million. The bar is generally only open during the weeks surrounding the Sturgis Rally, which took place this year from 1-8 August. Some attendees of this year's rally who visited the bar have said they felt it was in a particularly bad state of disrepair and as such have raised questions as to the cause of the fire. Officially, the cause of the fire remains unknown, but suspicions were further raised this week when a team of at least two dozen agents from the Bureau of Alcohol, Tobacco and Firearms arrived to investigate the incident. The ATF is the federal agency with jurisdiction over fires and arson. However, ATF Special Agent Robert Schmidt told the Argus Leader that his organization's presence isn't necessarily a sign of suspected wrongdoing. "We’re just another resource for the state and local teams," he told the paper. Meanwhile, Full Throttle Saloon owner Michael Ballard has expressed reservations over immediate calls to rebuild the bar. Responding to apparent fundraising efforts by fans he said on Facebook: "While we truly appreciate the support we are asking everyone to please hold off until we have a better idea of what direction we will be going."